Greetings from sunny 20 degree Minnesota – a great January day! It’s recently occurred to me that for a dairy blogger, I actually haven’t talked much about milk. Oops! I blog a lot about how we care for and raise our cows because that’s truthfully what I’m most familiar with. But I also know a thing or two about milk, and I see that there are endless choices, questions, and even misunderstandings about it. So I’m going to delve into this world of labeling lingo and see if I can shed any light. I think it’s great that we as consumers today have so many choices about what we wish to buy. Everyone in the agricultural community works hard to produce safe and nutritious food, including milk, and provide lots of good choices. With so many options though, it’s helpful to be educated about them. What do all these different words used to label milk really mean? Hormones – news flash: all milk contains small amounts of hormones. Whether the milk is labeled organic, natural, local or just plain skim, all milk naturally contains small amounts of the protein hormone bST (bovine somatotropin). Your body digests it just like any other protein. I did a bit of internet research, and everybody from world-renowned universities to organic groups to dairy promotion groups agree that milk contains hormones. It’s fine and natural for it to do so! When milk states that it’s from cows not treated with rBST, or rBGH, it just means that the cow has not been given more of the hormone than she naturally makes. The little “r” in front stands for recombinant, meaning it’s a synthetic version of the natural hormone. When milk is labeled in this way, you may also notice that it states that no significant difference has been shown between milk from treated and non-treated cows. I’m pretty sure this originates from a truth in labeling or advertising law because you can’t tell by looking at, tasting, or even testing milk whether it contains synthetic bST. This is because the natural and synthetic version of the hormone is the same. If you want more info, I found a pretty thorough website that talks more in-depth about the facts of bST. Antibiotics – All milk sold from farms is antibiotic free. I hate is when a company specifically labels their milk as antibiotic free because it’s rather misleading when all milk is antibiotic free, don’t you think? Now it is true that some milk is from cows that have never been treated with antibiotics, while most traditionally produced milk is from cows that may have been given antibiotics at some point if they were needed. We want to give our cows the best care, and if they are under the weather we want to get them well. You may give your child or yourself antibiotics if they’re needed, and it is no different for a cow. If a cow is being treated with needed antibiotics to deal with a sickness or infection, the use is carefully monitored and the milk from that cow is routed to a separate bucket. It does not go into the bulk tank or make it into the food supply. We continue to keep that cow’s milk separate until all antibiotic residue has left her system, and only then can her milk be put back with the rest of herd’s milk and sold. As an added precaution, every single load of milk that ever leaves our farm (or any farm) is tested for antibiotic residue. If any is found, the entire load of milk will be discarded. You can be very confident that all of the milk you buy is safe and absolutely antibiotic free. Organic – Organic milk basically refers to how milk is produced, not what’s in the milk. As I’ve just talked about, all milk contains hormones and no milk contains antibiotics. The same is true for organic. Specific production practices are required for milk to be labeled organic, including the fact that all feed the cows get must be certified organic. I think the USDA (U.S. Department of Agriculture) says it best because they oversee the rules and certification of organic products. Check out their website here for more info. And just remember, milk (if it’s cow’s milk) comes to you from ladies just like these. (Yes, I did feel the need to use a summer picture because I’m getting sick of snow! This was taken late August/early September.) It’s been a crazy week, but hopefully I’ll be back with some running tales tomorrow. 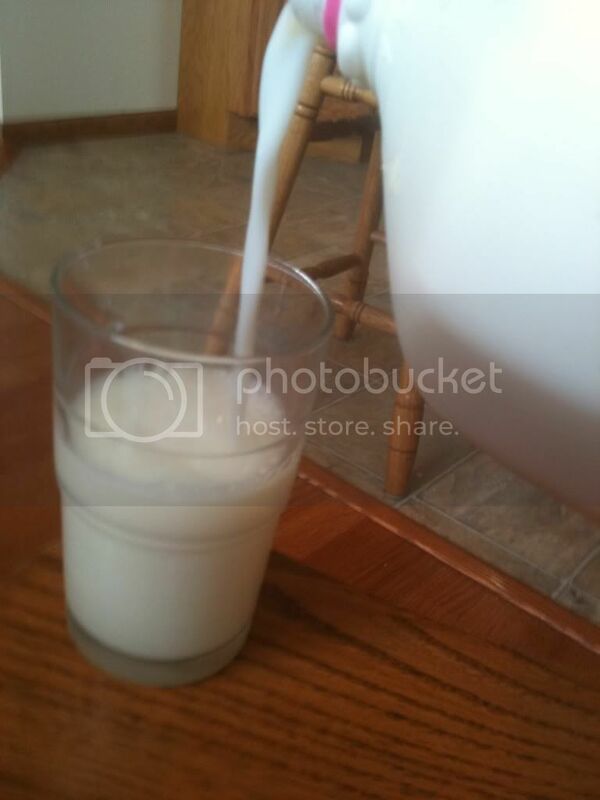 What other questions do you have about milk? Did I confuse you or did I manage to talk about something you found helpful? This entry was posted in Agriculture ( in general), Cows and tagged antibiotics, Cows, hormones, milk. Bookmark the permalink. 13 Responses to Got Milk? Got Questions? Lisa I love this post!!!!! Thank you so much for your clear and unbiased (even if you may not feel unbiased) explanations. I really benefited from them! In fact, I would have loved even more details and info! I once had a public nurse tell me to make sure to buy milk from cows not treated with rBST…especially since I had a little girl. She said she’s read studies about little girls growing pubic hair as young as 6 and that they’re attributing it to milk with “hormones.” My husband and I discussed it and agreed that this reasoning could not be sound (My personal opinion, which is unresearched, is that our culture is so sexually charged that these little girls are making too many of their own hormones at too young of an age do to exposure to too many sexual images……but I digress). Anyway, love this information. Thanks for posting it! I would love to hear your thoughts regarding if humans really do benefit from cows milk. I’ve heard some say that humans cannot even digest cows milk, that it contains too much protein, and that we are unable to use the calcium in in cows milk. I’m not inclined to believe this, but would be sincerely interested in what you think! First – I also have read and hear lots of horror stories about milk with hormones causing early puberty – even though all milk has hormones. I think the most sound medical theory that I’ve heard for why this is happening is due to poor nutrition/diets and obesity in children. Basically, many girls start to mature at a certain weight (even more than a certain age) so if you’ve got an obese 6-year-old little girl who weighs as much as an average 12-year-old, she may hit puberty earlier. Or even if she’s a normal weight, she may be eating a lot more processed foods/fats than normal. Again, this is something I’ve heard and don’t know to be fact, but it does make some sense to me. Great post Lisa! I don’t really worry about the milk I drink, aside from what percent I don’t care. Great post, thank you. If you don’t mind, I’d like to link this in my own blog. We get milk from a local dairy that we absolutely love, and I drink a lot of milk and get a lot of questions about it. You said it better than I ever could though…. Let me know if that’s Ok. Happy New Year! Hey Stephanie – please feel free to link to my post; I’m glad you found it helpful! Great post! So informative. I think because I great up in an area with many dairy farms, and visited my Grandma’s dairy farm growing up, I think seeing where it comes from and knowing the people who provide us with our milk makes all the difference. Can you share the name of the brand(s) that your milk is “bottled” under? (not sure if that is the right word!) I try to buy local but if would be nice to know for sure if I really am. Great questions – first off, most of the milk from our farm goes to a plant where it’s made into cheese and butter. My blog giveaway https://cowspotsandtales.wordpress.com/2010/12/01/a-giveaway-merry-christmas-with-cheese-on-top/ of Fieldgate cheese back in December was actually the brand our farm sells to. I think they maybe process a small amount of fluid milk, but it’s not much. You just enter the code on your milk (the website helps you find it) and it can tell you what plant it comes from. I enjoyed reading this post. Not a huge milk drinker over here, but life would feel incomplete without cheese and yogurt… which makes me wonder: along similar lines to Bree’s question about which brands your milk is bottled under — do you (or most dairy farms, or any farms?) sell directly to the milk brands? Or do you have your own that you sell locally? Do you sell any milk specifically to cheese or yogurt companies, or are those companies typically in charge of raising their own cows and seeing the cheese/yogurt process through from start to finish? Wow, the logistics of farming really makes my head spin whenever I think about it. You guys have to know and do SO much!! Whoa – this is a pretty big question. I could write for a long time on it (a future post perhaps) but I’ll try to give you a few specifics. 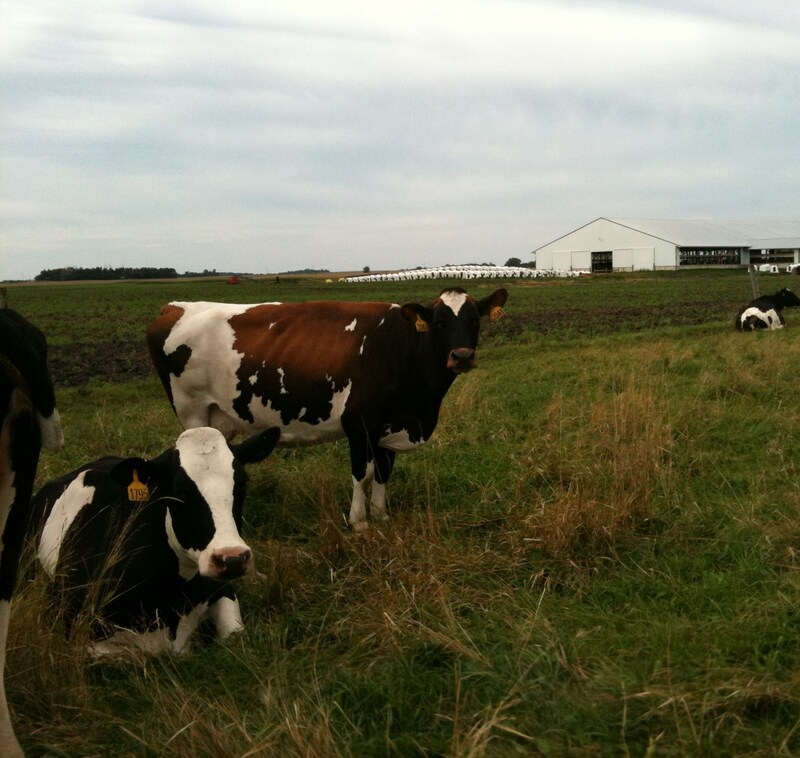 We sell our milk to a processing plant about 1/2 hour away, and it’s a cooperative (co-op), meaning it’s member-owned. Essentially all the farmers who sell milk to the co-op are part owners. Most of our milk is made into cheese and some butter. There’s also other dairy plants in our area ( Kraft and Land ‘O Lakes are names you may recognize.) Some of these buy milk directly from farmers while others just buy milk in bulk from other plants that buy more than they need. To my knowledge there aren’t actually any cows or farms that are owned by dairy processing companies. I would have to do some more research to be certain, but all dairy farms that I know of are owned by the farmer(s). For some companies in the meat industry they may actually own the animals, the processing plants and the brand, but that really isn’t the case for dairy. Lisa, thanks so much for this post. I think you did a great job being informative and objective and it was good to read your perspective. I don’t know if feeding George organic milk will really make any differnce in the long-run but, from everything I’ve read it certainly can’t hurt especially at this time when he is consuming large amounts daily. Thanks Jen! Glad it was helpful, and I’m happy to hear it’s important for you to include milk and dairy in George’s diet.